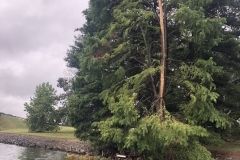 The text came at about 6:30 this morning stating that the weather looked like we were going to have rain and wondered if I was still going to bring my boat ? Before I looked at the text I was sure it was from John Reed asking the dreaded Question ~ should we cancel the meet ! 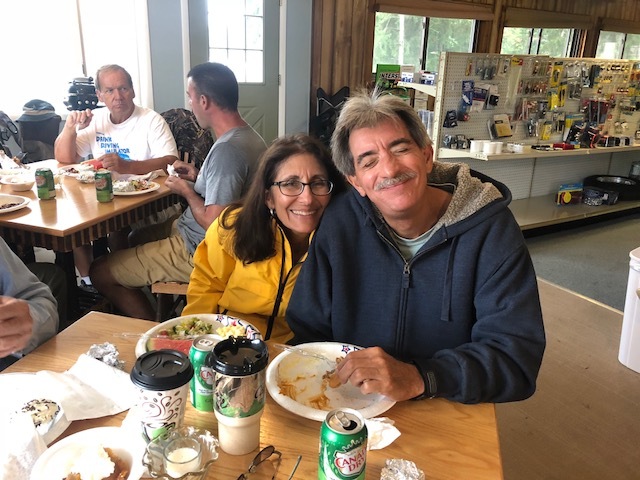 But slightly relieved it wasn’t from John, and my answer was, ” I have the boat all hitched up and ready to go so we’ll be leaving in about a 1/2 hour ! I thought at the last minute looking west & north I had better throw in a rain coat ! As we pulled out of the driveway the sky was dark with clouds and threatened of the rain to come, it hadn’t started at the 7 o-clock hr but there was no doubt in our minds we were going to get wet today ! A quick stop at my favorite speedway to grab a cup of their best Java to go and we were on our way ! Tooling down Rt 271 it didn’t take long till it started, probably just at the Mayfield road junction, it wasn’t a hard downpour but you could tell it was going to be an all day rain ! But having not heard from JR I told Peg we’ll go and make the best of it ! I told her it’s my fault as I got the truck washed yesterday ! It turned out to be just about a 2 hour drive to Leesville Lake and we pulled in at a little before 9:00 AM ! Looking around I didn’t see anyone I knew or any cars with boats I recognized ! A cold chill came over me for a couple minutes as I thought, did I not get the message that they canceled ? But in the next couple minutes a brown pickup Truck rolled in next to me with Bill Reed behind the wheel, relief ! He assured me the gang was coming but brother John would be a bit late ! As we sat there talking with rain coming in the windows several other cars pulled in, John Hagerman with Boat in tow, Don Moore was right behind him with boat in tow, Then Todd Mizen and son Tommy with a friend and their boat, Jerry Kay brought his trusty Chrestliner, Bob Korosa & Mike Seachrist pulled in with Bob’s boat in tow, Domonic Durda & MaryAnn brought Dom’s little pram, Soon John Reed showed up with his boat in tow ! My big surprise was seeing Our Wednesday wizard of electrical wizardry Mr. Bob Davidson with his beautiful double ender with the single cylinder inboard ! 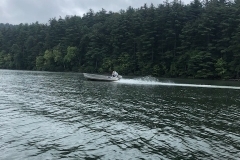 Mike Conner AKA the Watermelon Man brought his aluminum boat with his Nissan outboard on the transom. Dave Dufresne came and brought a little opposed twin Neptune to display ! John Fairgrieve brought his Aluminum boat with a early 50’s vintage Johnson 10 ! Somehow Rick Whitman must of slipped in with one of the Reed boys or maybe he came with Don Moore, either way it’s always great to bring someone with you ! 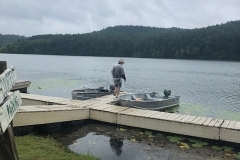 One of our other new members Dan Fawcett came and brought his aluminum boat, Good to see you Dan and I hope you’ll make more meets ! Another new Member, Randy Wilcox also made it to the meet as I hoped he would as I had a set of motor cowls sent down with me by our absent Treasurer Mr. Donut Bob Joynt ~ Hmmm there will be &^$^$#$ to pay for missing this one after all the grief Joh H. got about missing a Wednesday LOL ! On to the Day ! 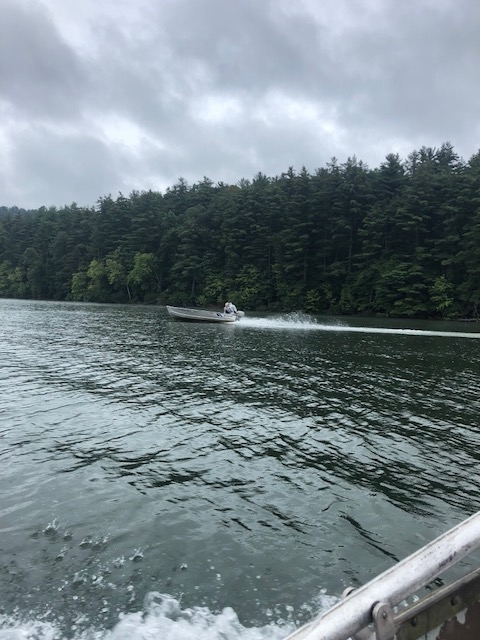 Our inspiration was set in motion by none other than our Chapter Photographer Mr. John Hagerman, First to launch his boat in the rain drops ! That was all it took and the rest of us splashed our boats like a herd of Hippo’s hitting the mud pool ! And the race was on with Don M. in the lead and me trying to catch him. He was fast with one of those mighty little KG7’s turning a ver suspicious none stock prop ! But Don’s lead was demolished when Brother Bill Reed brought out the ” Cruiser ” ! Dan Fawcett wasn’t far behind either of them in the runs up and down the lake ! 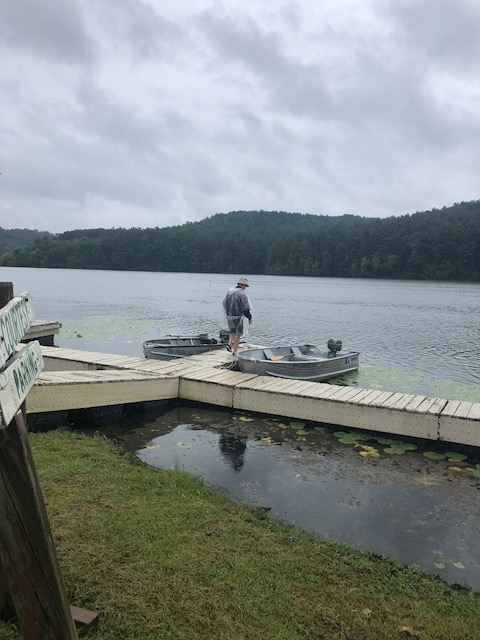 After I chased Don up the lake I stopped to pump out the boat as between the rain and splashing from sharp turns my feet were starting to get pretty wet ! Once I started the Chris Commander again I somehow got turned around and headed the wrong way ! As I cruised along the mighty Chris was running great but the scenery just didn’t look familiar ! Of course having the rain in the face when your heading into the wind didn’t help much ! I finally realized I’d gone the wrong way and turned around, found my mistaken turn and headed back to the launch area ! The next couple hours went by quickly as we watched our friends run their boats ! I did manage to take Randy Wilcox out for a ride glad he was willing to as it hadn’t let up a bit ! 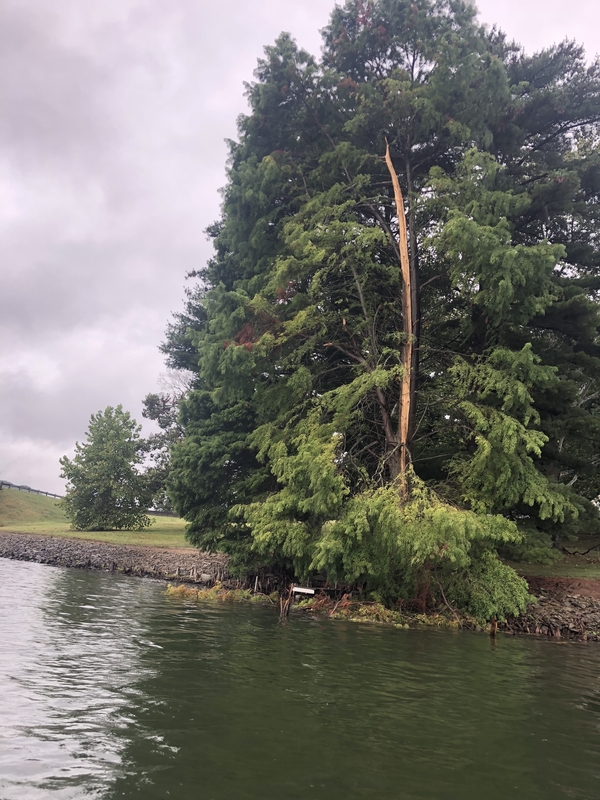 We did manage to see a tree that was hit by lightening and split from the top to the bottom of the trunk with all the branch’s lying in the water ! The Noon hour was upon us and the order was given that you don’t want to be late for Lunch ! And if you were, it was your own fault as you’d miss out on an excellent meal prepared by John Reed’s wife MayKay ! Sloppy joe With Cheese, Salad, Baked beans, potato dish and Peach cobbler with whipped cream YUM ! After lunch it was out in the boats for another run in the (you guessed it) rain ! John Hagerman asked me if I’d like to take his boat out with his KG7 on it ! Needless to say he had to twist my arm to get me to take it out ! What a ride, I’m always amazed at how well those little KG’s run but this one screams ! We’ve got to do a couple GPS comparisons between several of these 20 cid motors to see what speed they are really capable of ! My guess is John’s KG7 was running close to 25MPH on his boat ! Dan Fawcett and Don Moore may be hitting a bit more like 26-7 mph and Bill Reed might break the 30 mph ! I’ll make the excuse for my ChrisCraft Commander pushing the Little Arkansas Traveler as it’s been sitting down at my dock all sumer gathering a slimy bottom ! Another 20 cid engine is the Champion 16 1/2 and it’s clones the SeaFlyer & Voyager ! ScottAtwater also has a 20 cid engine but I don’t think it’s in the same category speed wise as the others ! You can bet I’ll be working on a speed certification test run for these 20 cid engines at one of our next Meets, and we’ll publish the results in the Outboarder to stir up some of the other Chapters ! 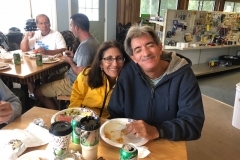 After the last big run with all the boats things started to get packed up and the gang was heading back home to dry out and think about what a CRAZY FUN day we all had playing in the rain ! I hope you all had as much fun as I did ! And our next meet is Oct 6th at Atwood Lake, for information contact Mike Seachrist Bob Joynt or me !